The structure and properties of public transportation networks have great implications for urban planning, public policies and infectious disease control. 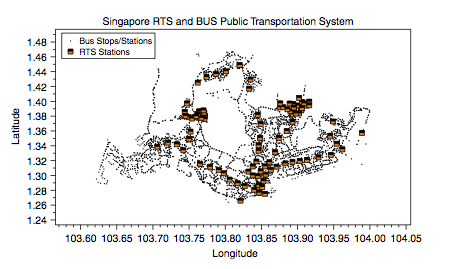 We contribute a complex weighted network analysis of travel routes on the Singapore rail and bus transportation systems. We study the two networks using both topological and dynamical analyses. Our results provide additional evidence that a dynamical study adds to the information gained by traditional topological analysis, providing a richer view of complex weighted networks. For example, while initial topological measures showed that the rail network is almost fully connected, dynamical measures highlighted hub nodes that experience disproportionately large traffic. The dynamical assortativity of the bus networks also differed from its topological counterpart. In addition, inspection of the weighted eigenvector centralities highlighted a significant difference in traffic flows for both networks during weekdays and weekends, suggesting the importance of adding a temporal perspective missing from many previous studies.